The MXR M-104 DISTORTION + Guitar Pedal can be set to produce low volume controllable distortion or increased to achieve a warm tube overdrive. Maxed out the MXR M-104 Pedal produces an extreme fuzz with long sustain. Stop the Video at 0:16 to see the Pedal. 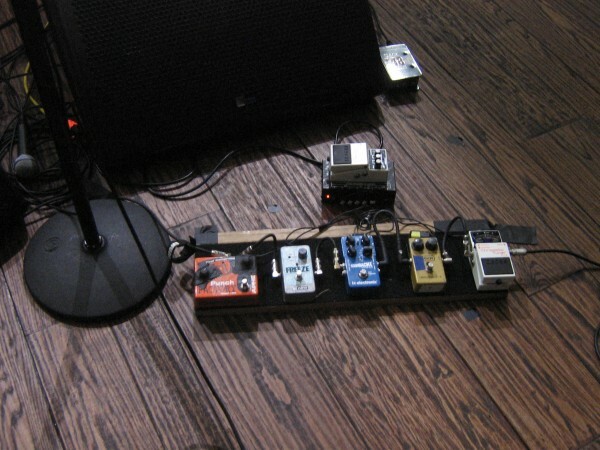 "This is the Pedal-Rig. 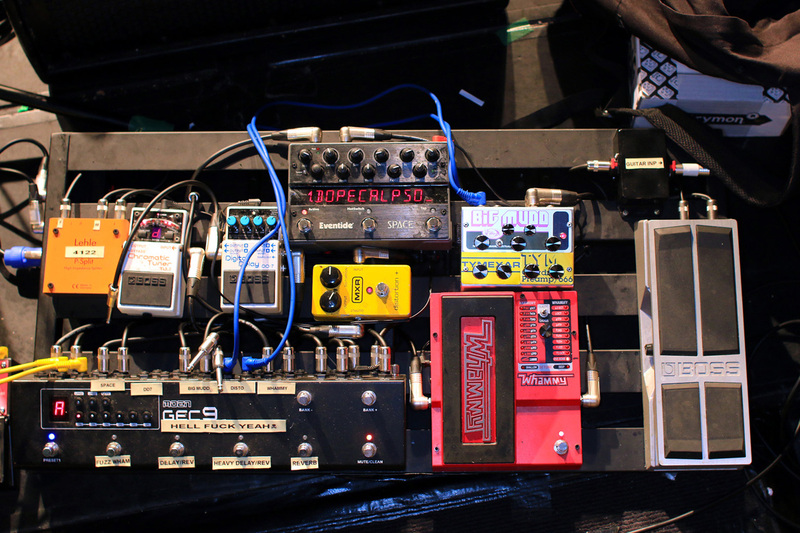 I'm a collector"
MXR M-104, as seen in the bottom row of Jamie Cook's pedalboard in this photo. Sam Halliday tweets about getting the MXR Distortion+ pedal. The MXR M104 Distortion+ is used by Slash. From http://www.kurtsequipment.com: 59). My conversations and emails with Earnie Bailey (Kurt's guitar technician). It is not stated when he used it; it seems only in some live shows. Thom was first seen with an MXR M-104 Distortion + Guitar Pedal in photos on DAS from the recording of In Rainbows. 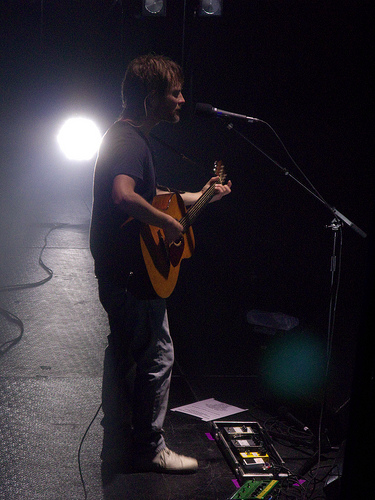 He used on the In Rainbows tour, and later for the 2010 Atoms for Peace tour. It can be seen on the main board in the source photo, second from right. The MXR Distortion + is also listed as part of Thom's gear on [fan sites](http://thekingofgear.com/thom#pedals). At the minute 14.47 of the "GuitarSpotGr"'s Video "Paul Gilbert - Live Setup", Paul Gilbert shows that he uses an MXR Distortion+ in combination to his Marshall amps to have a more distorted sound. As researched extensively by Wolf Marshall in his book, "An Annotated Guide to the Guitar Technique of Randy Rhoads" and listed on guitargeek.com, the MXR Distortion+ used by Randy Rhoads. 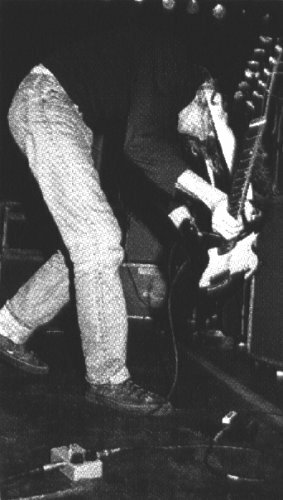 In [this](http://www.premierguitar.com/articles/22282-forgotten-heroes-hillel-slovak?page=2) Premier Guitar article, it is mentioned that Hillel Slovak uses an MXR Distortion +. In [this interview](http://www.premierguitar.com/articles/Tom_Morello_Interview), with Premier Guitar, when asked, "What were some of the guitar effects used on The Fabled City?" Tom Morello responds, "There’s an octave pedal, a DigiTech Whammy WH-1 (original), an MXR Distortion Plus on “Whatever It Takes” and basically I just had my usual pedalboard sitting there. Also Brendan O’Brien, the producer of the record, had a lot of stompboxes lying around the studio. I do some slide guitar and of course I incorporate some echo and delay; it’s about not feeling restricted in any way to the bare bones acoustic." "I have other pedals, like the Tech 21 SansAmp, Hughes and Kettner Rotosphere, ElectroHarmonix Memory Man, DOD FX10, MXR Distortion+, the BOSS VB-2, DM-2, HR-2, PN-2, and PH-1, Way Huge Red Llama, and Danelectro DanEcho." Guy uses MXR Distortion +, according to [this](http://www.guitargeek.com/guy-picciotto-fugazi-guitar-rig-and-gear-setup-1999/) Guitar Geek rig diagram. "And though his effects include MXR Distortion + and Phase 90 pedals and an Electro-Harmonix Electric Mistress flanger, "a lot of what you hear on the album's just maxed-out guitar and amp." An MXR Distortion + can be seen from this Instagram image from the official LIARS account. "That Carbon Copy is the best delay I've ever used, hands down, no contest... The Cry Baby wah-wah pedal is more than just another piece of gear on my pedalboard. I purchased one the day I bought my first guitar and have never played a show without in the last 25 years. The same goes for the MXR Phase 90, and the mustard yellow Distortion+. It's at core of my personal sound, I use it as lead channel, I use it in a set position as much as I use it in an up and down motion. I couldn't live without it!" the pedal can be seen in the middle of their chain in this video. MXR Distortion+: Greg used this distortion pedal only as a "gain pedal" on the first two Wipers records. By this, he means he kept the drive at the lowest possible setting and the volume at the highest possible, in order to drive his Ampeg Gemini/Fender Bassman into distortion without coloring the signal very much. He dropped it in favor of simply manipulating his guitar's volume knob from "Over The Edge" and onward. It is actually unknown if he uses a distortion pedal or not. Bob Mould uses an MXR Distortion + pedal, according to ACL's [website](http://acltv.com/2013/01/25/gear-blog-bob-mould/). In this photo [(source)](http://www.kulick.net/blog/index.shtml#day49), the MXR Distortion + is visible. 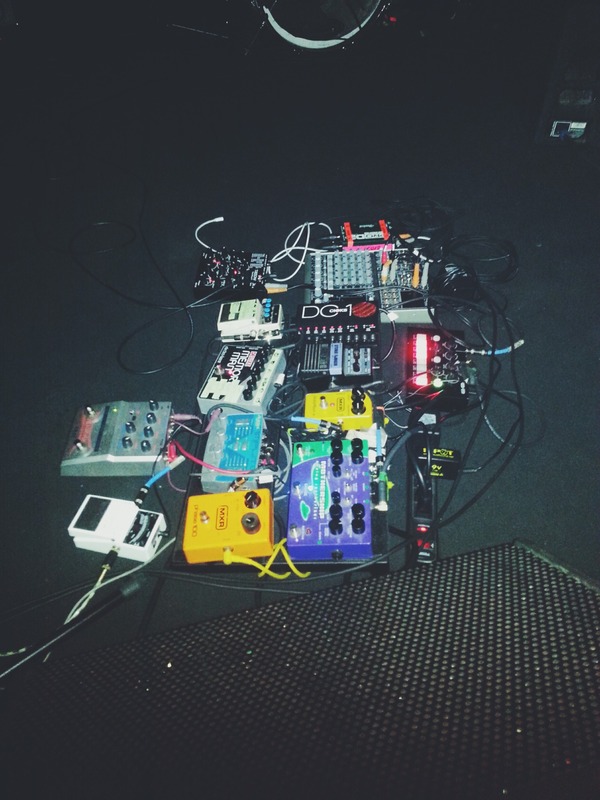 In this Australian Musician photographical interview with the Australian band Violent Soho, there is a clear picture of Boredom's pedalboard with the MXR Distortion + in the centre. According to gear section on Kadlecik's website, he uses "reissue" version of MXR Distortion +. What appears to be a MXR Distortion + can be seen on her pedalboard. At 1:22, Izzy's pedalboard can be seen. This is a great sounding distortion pedal. I use it with my X0xb0x to tear up my Acid bass lines. It adds a lot of lovely nastiness and energy. I love it! Great Green Day/Weezer-y tones, and great on both guitar and bass. My favorite distortion so far. I used this as booster and is really good. Its sounds more like a mixture between a fuzz and an overdrive, the sound is perfect for rock and it works nice with reverbs for solos, but you won´t play the hard stuff with it. I use this to saturate my tone, it also acts like a treble booster, works as I want. This is a great standard distortion pedal. This isn't a low gain pedal and isn't a fuzz and doesn't go crazy like overdrive. So to say this pedal is great for distortion. This is also a nice simple and not too costly pedal. But I also like pedals that I can tweak around with a lot, this pedal doesn't offer too much of that (with only having an output and distortion knob), this clearly isn't the pedal for that but if you need a good simple distortion pedal this is the one to get. This is the perfect distortion pedal. It doesn't take away from the the tone of the amp – only adds to it. Pretty much the first pedal I've got. I don't use it anymore, but I can remember making all sorts of noise with this classic pedal.